The content of the book entitled The Statistical Life of Me: A Statistics-Based Journal by Emily Higgins can be a bit of a surprise. It is indeed, by and large, a notebook with many empty pages to be filled by a reader who is interested in taking control over his/her daily activities. The book is based on three key assumptions: (1) Most of human thinking, feelings and actions in a person's day-to-day interactions with the material and social worlds are routine activities. That is, they are actions that can be described as automatic, unconscious, and often impulsive. (2) If such routine activities are recorded accurately on a daily basis, the reader's view of his/her records across time (e.g., a month) may reveal patterns of unhealthy behavior. That is, recorded patterns may lead the reader to become aware of not only the nature and frequency of his/her actions, but also their consequences on physical and mental health. (3) Awareness of unhealthy patterns may lead the reader to acknowledge both the immediate and gradual consequences of current habits and then implement long-lasting behavioral changes. The first assumption is so obvious that it is difficult to dispute, whereas the second is debatable and the third is truly uncertain. The author's suggestion of developing a daily diary is mostly based on the key assumption that awareness of undesirable behavioral patterns can foster desirable behavioral changes. Of course, knowledge of patterns of daily activities can enhance the person's awareness of the immediate and gradual consequences of his/her actions. For example, consider a person who sleeps much less than his/her brain requires. Tiredness may initially be counteracted with coffee, energy drinks, and other stimulants. As time goes by, however, the effectiveness of such stimulants decreases and declines in performance become much more visible (e.g., escalation in the number of accidental errors made at work, difficulties in thinking clearly, severe sleep disturbances, etc.). The person may become aware of the negative consequences of his/her lack of sleep by simply considering some glaring issues in his/her life without the help of a diary. What the diary may do is to help highlight action patterns whose links to undesirable consequences are less clear or less immediate (e.g., the extent to which repeated intake of some types of food or prolonged lack of adequate physical exercise may shape a person's mood). Yet, apparent patterns that link actions to their purported outcomes may be merely correlations or the observed outcomes may have multiple causes, thereby making a person's collected statistical patterns likely to either be misinterpreted or remain puzzling. Thus, it is clear that a missing component of The Statistical Life of Me: A Statistics-Based Journal is some helpful information on how to interpret likely patterns of actions and consequences. At the very least, the author ought to have made an effort to offer links to online databases and other reputable sources of physical and mental health information (e.g., https://www.hhs.gov/programs/topic-sites/index.html). Of course, the smart reader is entitled to ask himself/herself whether a simple notebook along with some helpful advice from reputable websites on physical and mental health may be enough. If the complexity of the recorded patterns makes interpretation difficult and/or uncertain, the daily recordings of one's behavior made in the notebook may be shared with a competent health professional who can offer sensible, science-based advice. Although awareness may be a necessary step for behavioral change, important to note is that the link between awareness of the consequences of one's behavior and implementation of behavioral change is tenuous at best. Thus, what a diary is unlikely to do, irrespective of the quality of the paper in which it is developed, is to ensure behavioral change. 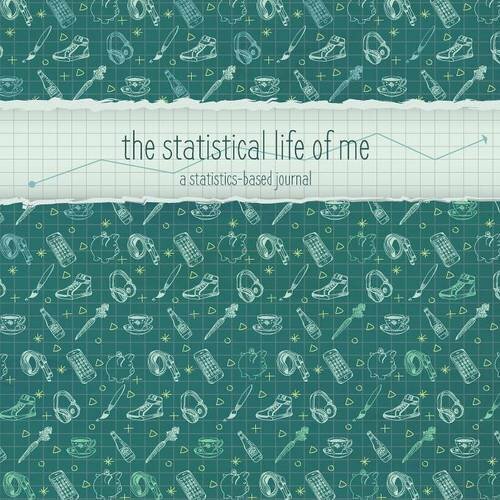 The author of The Statistical Life of Me: A Statistics-Based Journal encourages the reader to take control over his/her life by recording daily behaviors, but fails to help him/her not only to interpret behavioral patterns and their links to specific physical and psychological outcomes, but also to emphasize that awareness is not sufficient to produce change. The reader's motivation is the necessary stimulus which can be induced and then supported by a variety of circumstances (e.g., an unexpected visit to an emergency room, a sudden experience of pain, the unintended meeting with a much healthier friend, etc.). Furthermore, if a change in one's habits is to be preserved well beyond the time a decision is made to alter undesirable behavioral patterns, supportive environmental circumstances may also need to be present. At the very least, the person's environment is expected not to defeat his/her attempts to change. Surprisingly, no mention of such circumstances and their defining characteristics is even attempted by the author. In sum, the idea of keeping records of one's activities is reasonable, but stale if it is not accompanied by information relating one's habitual behavioral choices to their likely consequences. The activity can even prove to be misleading if it is not fuelled by the person's intention to improve his/her current condition, and by his/her seeking to cultivate a supportive environment. What are statistical tools of daily behaviors without the informed lenses of the interpreter and the determination to change in the person who has generated the data? The answer to these difficult questions is not found in the fancy notebook named The Statistical Life of Me: A Statistics-Based Journal. The answer resides in ones' determination to seek knowledge and in the situational determinants that can lead to longstanding progress.